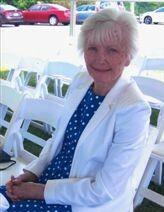 Mary Doreen Fildes, formerly of Hardinsburg/Enterprise, died January 23, 2019 of complications of Alzheimer's disease and congestive heart failure at the Stonehenge Assisted Living Facility in Blairsville, GA at the age of 90. The daughter of Clay C. and Awilda Rush Hawkins, Mrs. Fildes was born in the Hites Run community of Breckinridge County, KY on November 28, 1928. She was preceded in death by an infant son John Clay Fildes and her husband Command Sgt. Major (U.S. Army retired) Norman R. Fildes, whom she met in Lexington, KY and married in 1948. As an Army wife, she lived in the Panama Canal Zone, Mississippi and Alabama. In later years, she lived in Tullahoma, TN, Annandale, VA and Elizabethtown, KY.
During her husband's Army career, Mrs. Fildes and her children resided in her native Kentucky when her husband was stationed overseas. She was active in the Breckinridge Homemakers Club and was an active member of Hites Run Baptist Church. After living in Alabama for 30 years, she and her husband returned in 2000 to Hites Run where she lived until 2009. The family will receive visitors at Trent-Dowell Funeral Home 308 South Hardin Street Hardinsburg, KY 40143 on Monday, January 28, 2019 from 4-6 PM. A memorial service will follow at 6 PM. Mrs. Fildes will be interred with her husband at the National Military Cemetery in Lebanon, KY on Tuesday, January 29, 2019. In lieu of flowers, memorial donations, if desired, may be made to St. Jude Children's Research Hospital in Memphis, TN.